A great cover for Martian Comics #5 (2016) with art by David A. Frizell is a homage to the classic film, A Voyage to the Moon (1902). Image Source: Martian Lit. See images today from a Kickstarter campaign for a comic book about Martians' view of Earth, The Canals of Earth! "Humans have long looked to the sky and wondered about Mars. What if someone was looking back? The Canals of Earth is the story of how Mars sees Earth, running from Martian prehistory to its space age. 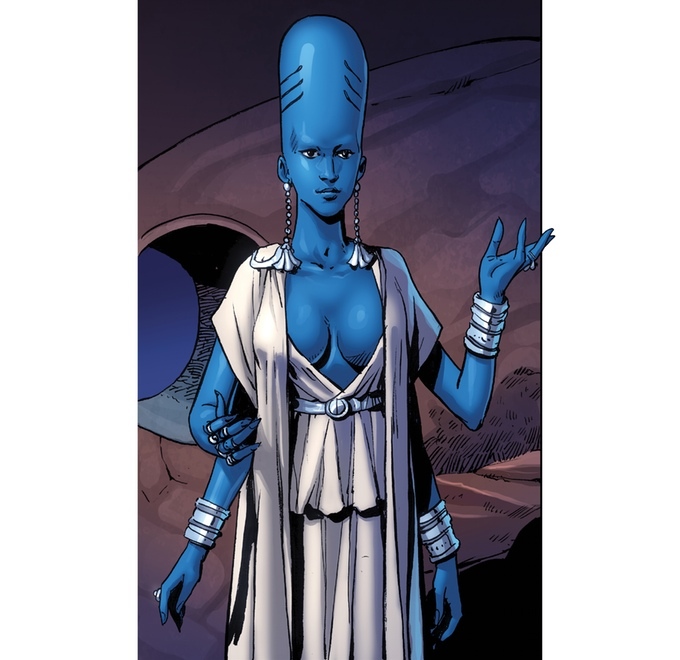 We begin in Martian prehistory, when Martians looked to the skies and imagined Earth as a goddess. We see some of the Martian mythology about Earth, tied to the invention of writing. We then see Martian science-fiction, in which they imagined aliens in their own image." 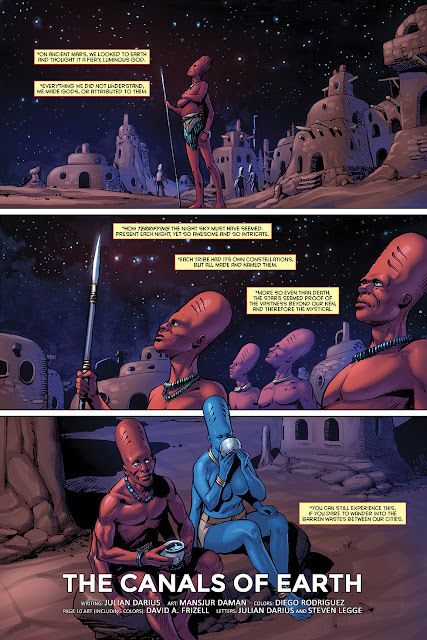 This comic, fifth in the series Martian Comics (2014-present; details here) is written by Julian Darius, with art by Mansjur Daman and colours by Diego Rodriguez. Darius has a doctorate in English Literature and founded the Sequart Organization, which promotes sequential artwork in graphic novels and comic books as a legitimate art form. You can still support the Canals of Earth project here until 27 April 2016. While the imagery of the comic's cover is taken from the turn-of-the-century French film, A Voyage to the Moon (see it below), the book's title is taken from late 19th century studies that there were canals on Mars, based on observations of the Red Planet by astronomers Giovanni Schiaparelli (1835-1910), Percival Lowell (1855-1916), and Charles E. Burton (1846-1882). First page (click to enlarge). 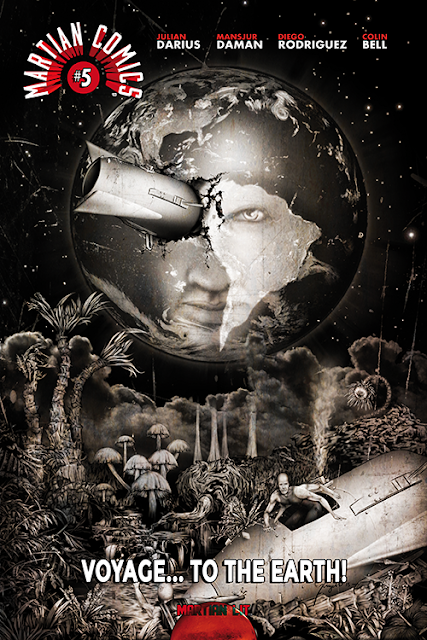 Image Source: Martian Lit. 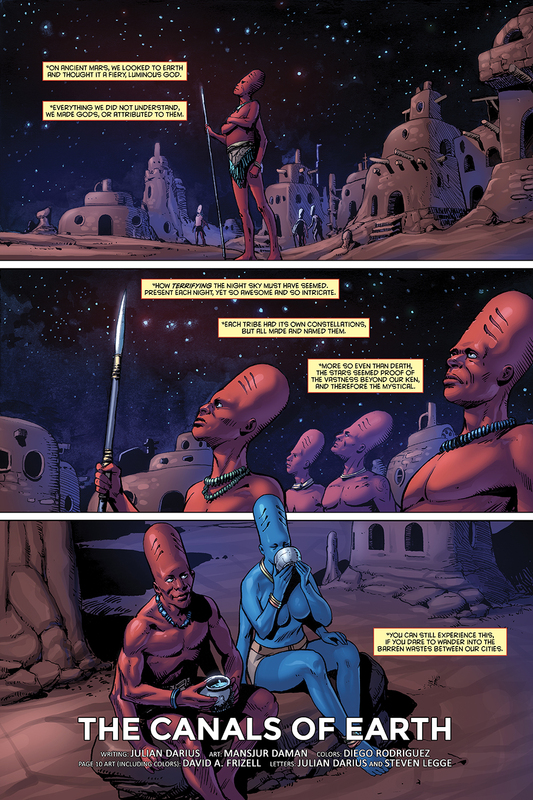 Martian Comics #5. Image Source: Kickstarter. Kickstarter promo video, Martian Comics #5, The Canals of Earth! 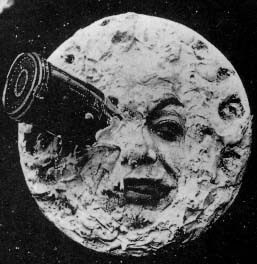 The iconic image of the Man in the Moon from Le Voyage dans la Lune (1902). Image Source: Wiki. The early sci-fi film, directed by Georges Méliès (1861-1938), Le Voyage dans la Lune (A Voyage to the Moon; 1902) in the original black and white. Video Source: Youtube. Le Voyage dans la Lune (A Voyage to the Moon; 1902). Contemporary hand-coloured version, which was made by 200 people painting directly onto film stock with brushes. Video Source: Youtube. 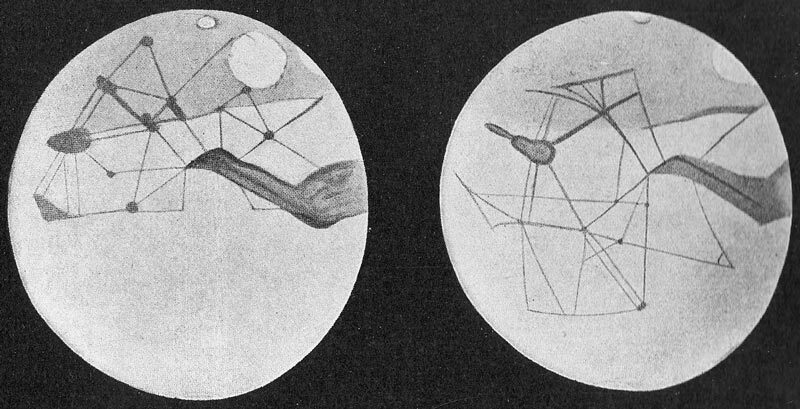 Drawings of supposed canals on Mars by Percival Lowell, published: Яков Перельман - "Далёкие миры". СПб, типография Сойкина (English transliteration: Yakov Perelman, "Distant Worlds" (St. Petersburg: Soykin printing house, 1914). Image Source: Wiki. Lowell was also part of the group who initiated efforts to discover Pluto, which occurred after his death.